Yep, the spending continues! And this time it’s on probably my most expensive purchase ever! For an absolute AGE I have longed to replace my now 10 year old laptop for a high powered replacement! 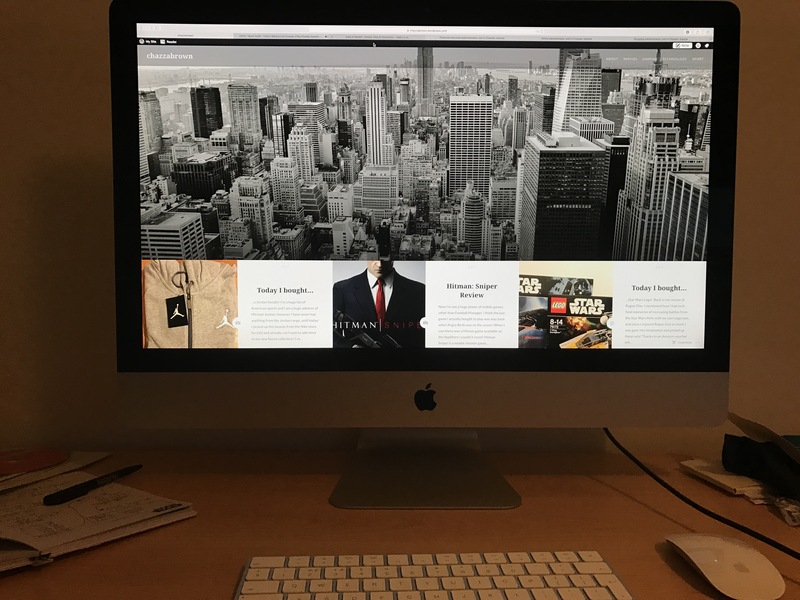 I had been deliberating for the past couple of weeks on which machine to choose, and after several pros and cons lists were made and plotted onto my notice board, I finally settled on the mighty 27 inch iMac with 5K Retina display. Oh and how it is pretty – I can’t take my eyes of it’s crystal clear display! Finally I now have the capability to use photoshop, illustrator and now potentially look into app development, something which I had only dreamed of being able to do on my prehistoric laptop! I am sure I will be posting about my new shiny baby very soon, so be sure to follow and keep your eyes peeled! I’m a huge fan of American sports and I am a huge admirer of Michael Jordan, however I have never had anything from the Jordan range, until today! I picked up this beauty from the Nike store for £60 and already can’t wait to add more to my new found collection! I’ve already picked out two pairs of shoes that I NEED! Now I’m not a huge player of mobile games, other than Football Manager, I think the last game I actually bought to play was way back when Angry Birds was on the scene! When I saw there was a Hitman game available on the AppStore I couldn’t resist! Hitman Sniper is a mobile shooter game following the main protagonist, Agent 47. The gameplay is simple yet delightful, you play as Agent 47 and are tasked with taking out enemies in various locations with a sniper rifle. The graphics are fantastic and the game plays so smoothly it is a joy to behold. From sniping a guard and watching his lifeless body plummet off of a rooftop into a swimming pool, to drawing an enemy out of cover by setting off a car alarm, this game will definitely bring out your inner assassin! Just remember where you are when you are playing – I got a few dodgy looks from colleagues at lunchtime last week as I chuckled to myself whilst I executed a perfectly timed headshot on one of my targets. Whether you are looking for a quick fix whilst you have are waiting at the bus stop or if you are looking for something to pass that long morning commute, Hitman Sniper ticks both boxes. The campaign / mission modes take no longer than 10 minutes to complete whereas the Death Valley Challenge Mode, where you defend a human against an attacking zombie horde, can last an age! To buy or not to buy? – Hitman Sniper is one of the best mobile games I have played in recent years. It combines both stunning visuals with highly entertaining gameplay, worthy of a space on your phone’s home screen. 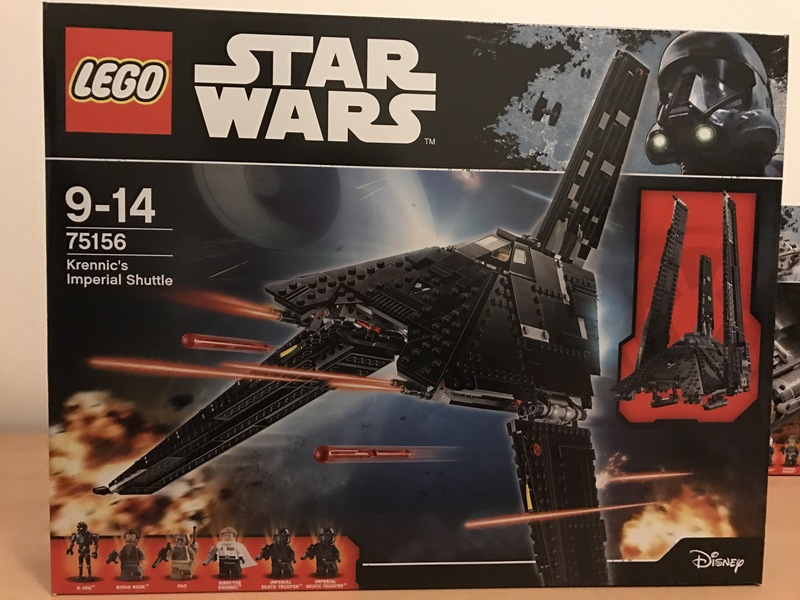 Back in my review of Rogue One, I mentioned how I had such fond memories of recreating battles from the Star Wars films with my own Lego sets, and since I enjoyed Rogue One so much I was gave into temptation and picked up these sets! 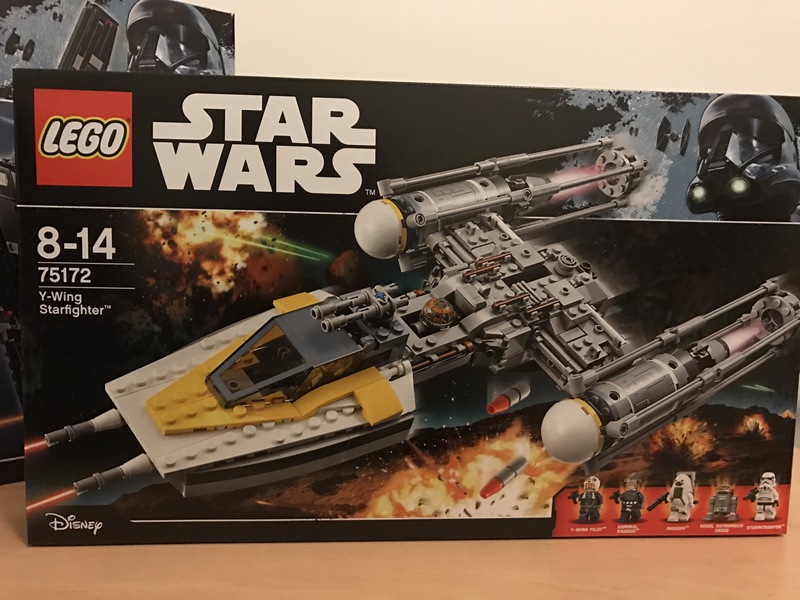 Thanks to an Amazon voucher left over from Christmas and Amazon’s reasonable prices for Lego sets, I managed to pick up the both of these for less than £100! Sadly however, until I move out into my own house (hopefully within the next 12 months), I don’t have anywhere to put them once built. Anyway, I’m sure they will look great in my man cave this time next year, for now I’ll just have to plan out my battles in my head! Tom Clancy’s Rainbow Six Siege is a game that I have wanted to play for an absolute age but never got round to it, so when it became free to play the other weekend on the Xbox Store I thought it would be rude not to test it out! Rainbow Six Siege is a first person tactical shooter which has a main focus on a cops vs robbers theme. The game primarily focuses on a terrorist play style with one team defending the objective from the attacking team. I delve straight into the action and join my first online match with no prior tutorial. HUGE MISTAKE. After 3 rounds of total without me even registering a kill, I decide it would be best to at least figure out the controls before I dare venture online again! After a few practices on the single player ‘situations’ mode getting used to the controls and gameplay, I head over to the big leagues for a second attempt. This time I’m much better equipped and manage to finish the first game with a respectable 3 kills to 2 deaths. The game itself is truly a masterpiece, I was a huge fan of the other Tom Clancy game released in recent years, The Division, but I think I may just like Rainbow Six Siege a little bit more! The game is basically a combination of search and destroy from Call of Duty and the general destruction and fun of the Battlefield games. The secret to Rainbow Six Siege’s success lies in the variety of operators you can play as, ranging from attackers who have the ability to use breaching charges to destroy reinforced walls to defenders who carry a heartbeat sensor to detect enemy positions through walls. The amount of variations are phenomenal and there is a class available to suit everyone. Whilst multiplayer is the star of the show and that is where the majority of the action takes place, I would like to have seen a single player mode in the game. Yes there is the ‘situations’ mode, but this really is just to give you a feel for the game more than a rich campaign. Thankfully the multiplayer is of such a high calibre of quality this more than makes up for the lack of single player! Buy, wait for sale or avoid: I picked this up myself on the Xbox marketplace sale and would definitely recommend you do the same! The Outer Rim DLC pack includes maps from two different locations, Jabba’s palace on Tatooine and a factory on Sullust. Both of these maps are highly detailed and offer a nice variety from the standard maps on the game. Jabba’s palace is my particular favourite of the two – exploring Jabba’s palace as Luke Skywalker and entering the rancor pit sends nostalgia levels through the roof! The two Hero / Villain additions, Nien Numb and Greedo, are a good change as well offering something different from the standard characters. The second instalment of DLC takes place in the Cloud City of Bespin. In my opinion, this is the worst of the 4 DLC packs. Whilst in the Outer Rim DLC there are two planets where the action can take place, the Bespin DLC only contains the Cloud City map. To make matters worse the maps are bare and fairly uncreative. The two hero / villain additions, Lando Calrissian and the bounty hunter Dengar, are unexciting and to be honest the worst characters to play as on the game. The silver lining for the Bespin DLC is how Star Wars’y it feels. The incorporation of the twin-pod Cloud Car adds some variety to flying and helps give you the authentic Bespin feel. As usual, EA went about their money grabbing ways by not incorporating any space battles into the main game of Battlefront, but then deciding to add them in to the game as DLC. The Death Star DLC covers battles taking place inside the Death Star and space battles outside of it. Whilst I’m not particularly good at Fighter Squadron, I have thoroughly enjoyed piloting an X-wing in to battle, avoiding asteroids whilst hunting down helpless Tie Fighters. The Death Star run is also a magnificent mode and trying your best to do the ‘trench run’ whilst not being shot down by enemy fighters is every Star Wars fan’s dream! Whilst the space battles are illustrious and immersive, the maps on board the Death Star itself are a little disappointing. A lot of the rooms are too similar and the maps are fairly small. I would have liked a larger exploration of the Death Star to be possible, for example exploring the trash compactor would be sweet. The hero for the Death Star is everyone’s favourite wookie, Chewbacca, and the villain is the bounty hunter Bossk. Chewbacca is nothing special, offering very little compared to any of the other heroes, whereas Bossk is one of my favourite playable characters on the game – his grenade firing launcher creates untold havoc! The final DLC ties in with the latest Star Wars film to grace our screens, featuring only the one map, the tropical planet of Scarif. The map itself is stunning, the lush forestry and the crystal clear waters make Scarif look more like a dream holiday destination rather than a war zone. As good as it looks however, the map feels bare and is filled with glitches. There have been numerous occasions where I have used my jet pack and ended up stuck on the environment. The hero for the Scarif DLC is Jyn Erso of the rebellion and the villain is Director Orson Krennic. Jyn is nothing special in comparison to some of the other playable characters on the game, but Krennic is a force to be reckoned with, his astromech droid being particularly fun to toy with enemies with. Overall the Star Wars Battlefront DLC has its ups and downs, but as a whole it is very enjoyable and I’m sure it will keep any Star Wars fan occupied for hours. Fresh off of the back of a hugely successful season last year we head into 2017/2018 season with high hopes. 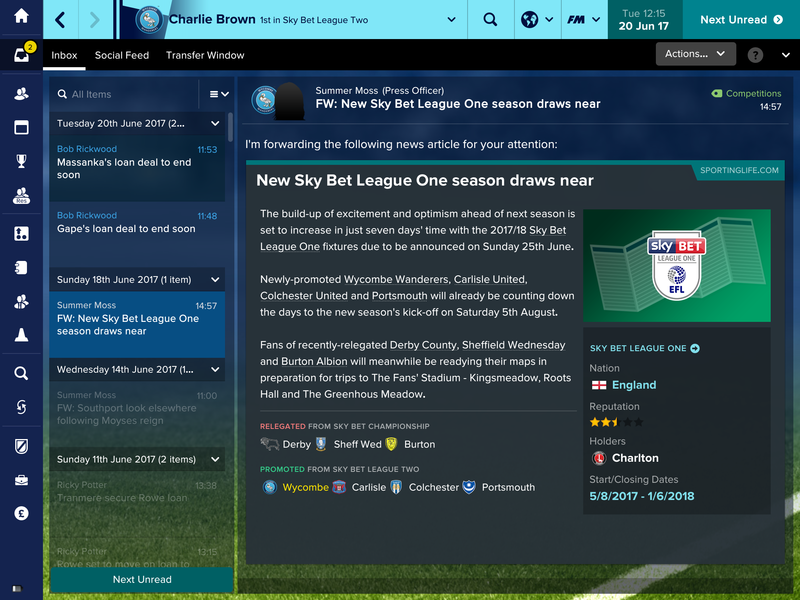 The bookies have us down as one of the favourites to go back down to League Two but I feel as if the team we have, coupled with a few new additions to the squad which I have my eye on, we should be finishing in the top half of the table at least. This season I also have hopes we can have a decent cup run in at least either of the FA Cup or the EFL Cup. Before we get our season underway, we firstly look at strengthening the squad. Being honest, we could do with strengthening all positions, and luckily we do manage pick up some great players! Firstly we pick up the experienced talisman Darren Bent on a free transfer. Bent has proven himself year on year as a top goalscorer and himself and last year’s top goalscorer Dayle Southwell up front we would be a force to be reckoned with! Next we focus on strengthening the midfield and we manage to secure Dominic Gape on a permanent deal. Last year we had him on loan from Southampton and he played a key role in the midfield so I could not let him slip from our grasp! 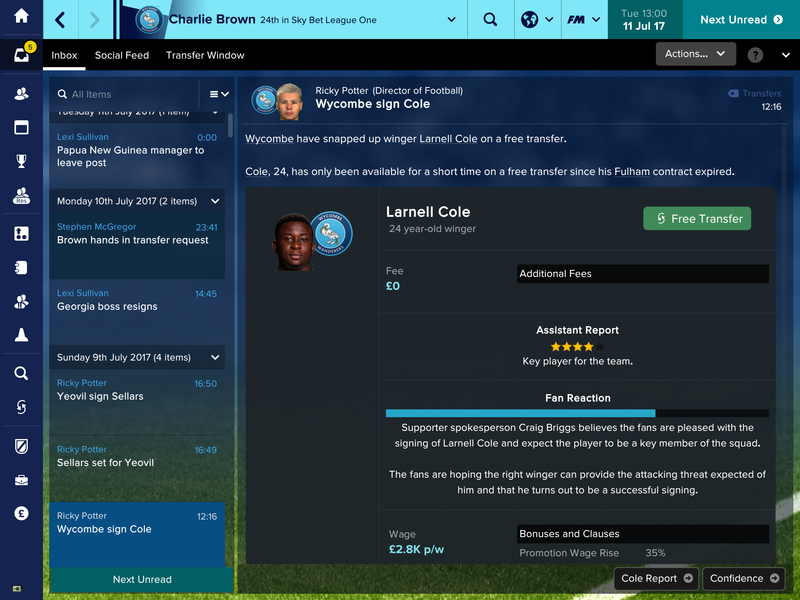 Our next big signing of the summer transfer window is ex Manchester United winger Larnell Cole. Cole, was playing for Fulham last season before being released in the summer and I have no doubt that he will be an instrumental player for us this season and in seasons to come. We also manage to secure a backup keeper who also plays at international level and also a youth striker who we will look at getting out on loan or putting him into the reserves. Our season gets off to a flyer with us going on a great run of form and causing a few upsets. 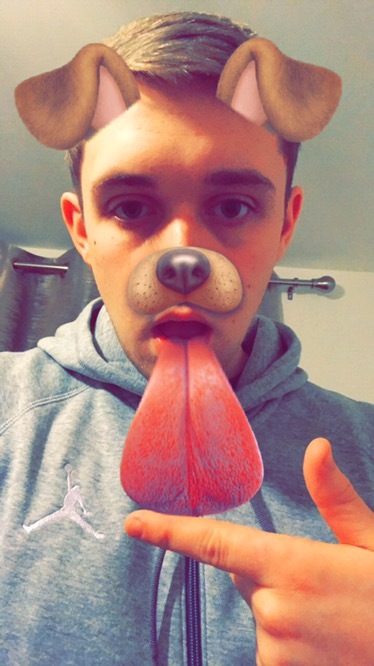 Despite the great start to the season, disaster strikes as golden boy Dayle Southwell damages his cruciate ligaments and looks set to be out for 8-10 months. To make matters worse the injury crisis continues as Dominic Gape suffers a short term injury and Southwell’s stand in replacement Paul Hayes suffers a broken ankle putting him out til late in the season. 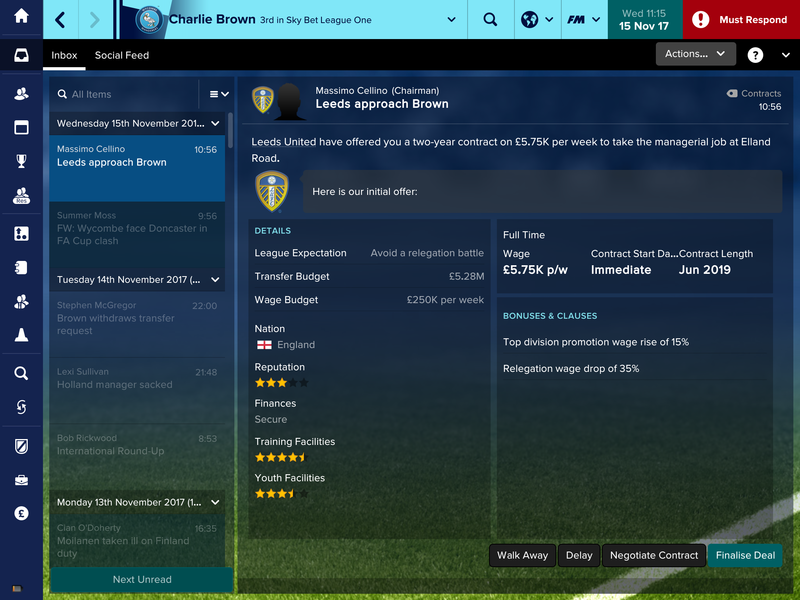 My management skills do not go unnoticed either as Leeds United come in for me offering me the job in November. 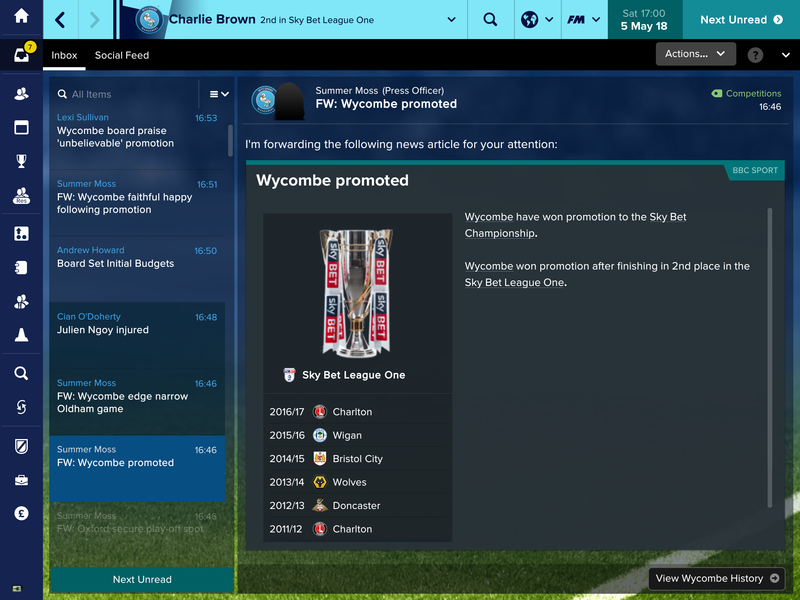 I can’t quit now though, I am leading Wycombe to greatness! Whilst the injuries may have hampered our squad, they definitely did not hamper our form! Amazingly we are somehow top of the league come Christmas Day! This is a remarkable achievement from the team, especially with the injuries we have had. The league appears to be turning into a 3 horse race between ourselves, Derby and Sheffield Wednesday with a slight gap between Wednesday and the chasing pack. 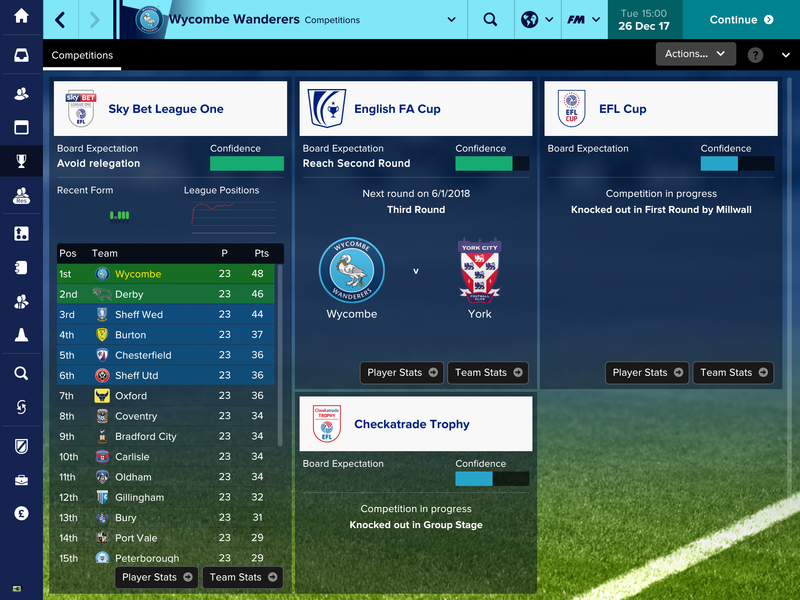 Our cup campaign is fairly disappointing in the EFL cup though, but we should at least beat York in the FA cup to progress further. 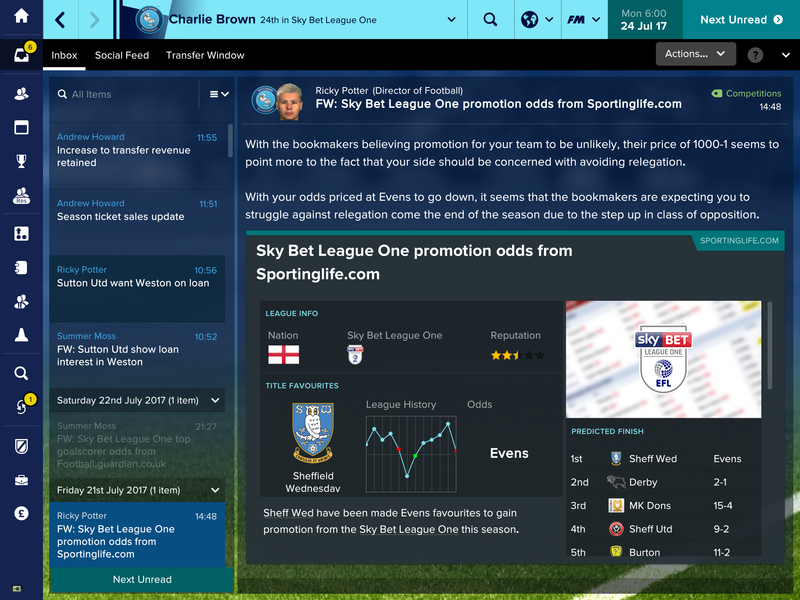 As the January transfer window rolls round, I set the main focus of the window on securing the players I currently have, making sure we do not lose anyone to any bigger clubs. We manage to secure contract extensions for most of our key players and the only player we actually bring in is 17 year old youth player, Scott Campbell from Celtic, for the fee of £100K. 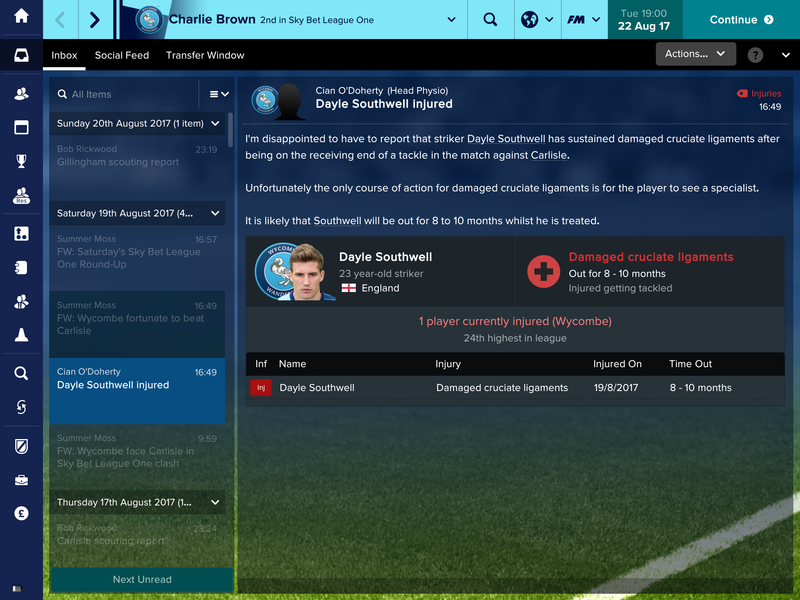 Campbell looks like a fantastic prospect and I decide to keep him in the reserves rather than sending him out on loan as I would like to potentially give him a few games in the first team. 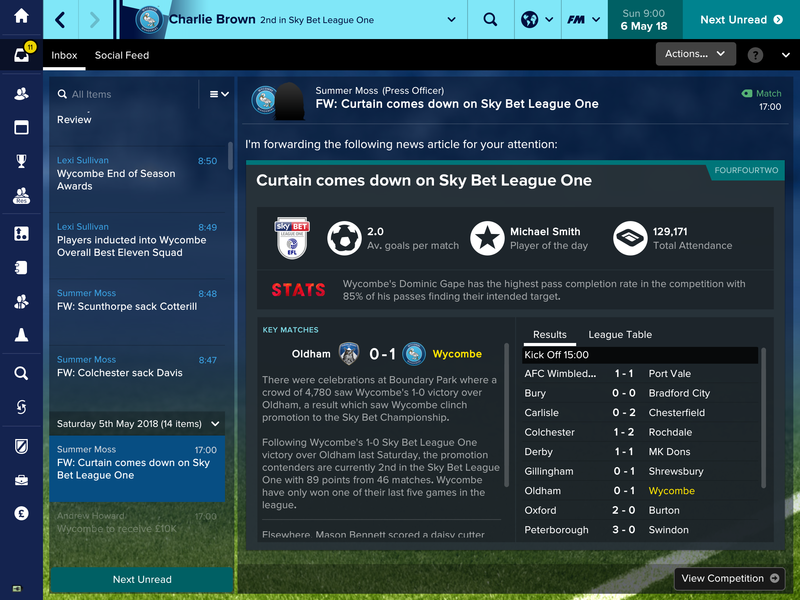 With it heating up at the top of the table and us in a prime position to achieve back to back promotions it is hugely important that we maintain performances to the same standard as we have been. Whilst Dayle Southwell’s long term injury seemed like the end of the world at the time, Darren Bent’s free-scoring form has lead him to become one of the most feared strikers in the league. 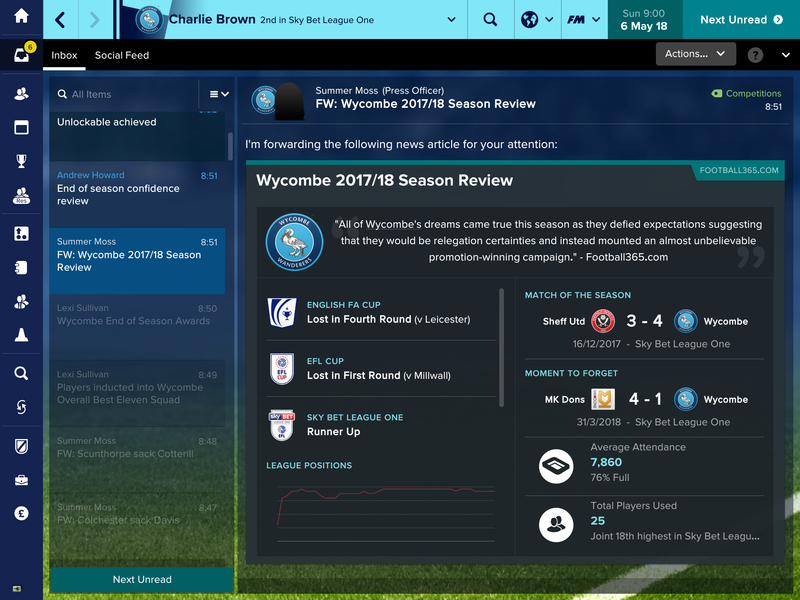 Magically, in a thrilling end to the season, we actually manage to achieve back to back promotions! We didn’t make it easy for ourselves though – stumbling against teams right at the end when we should have easily been beating them considering our form throughout the campaign. 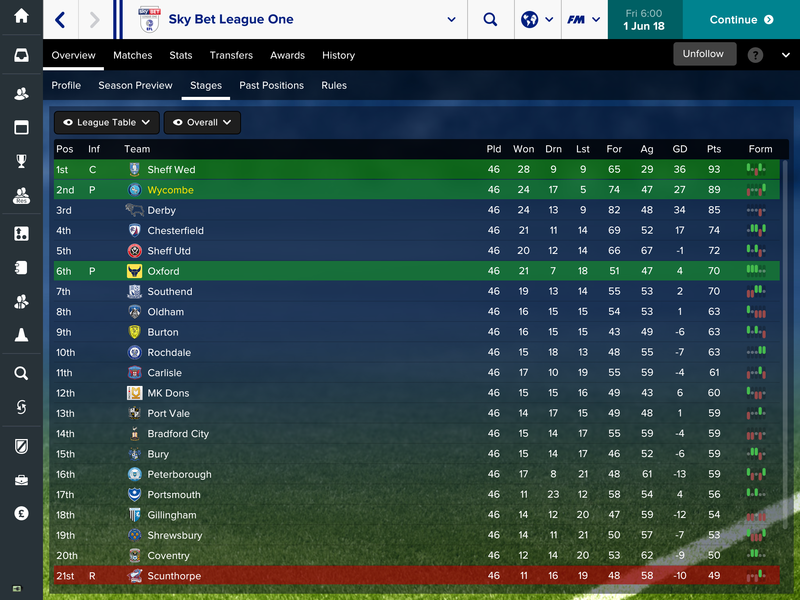 In fact it went down to the final game of the season which meant we just about clinched promotion over Derby County! On top of a fantastic league run we also have a great run in the FA Cup as we managed to reach the fifth round before being knocked out by Leicester City. 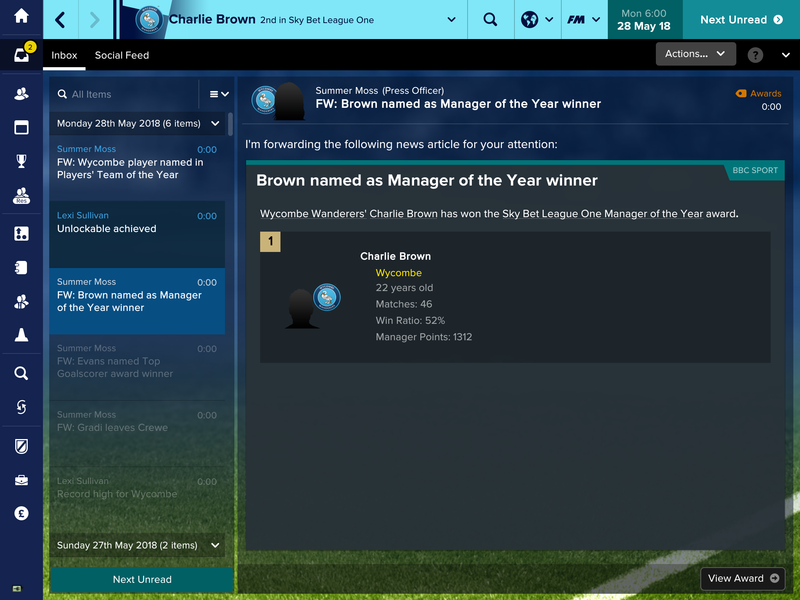 The performances again do not go unnoticed as Wycombe are hailed as the biggest overachievers and I win Manager of the Year for the second year in a row! Yet again this is a remarkable achievement for the club and I dream of one day taking them on to win the Champions League!